Lovely period property with a contemporary twist near the seafront and adjacent to Kemptown Village's range of independent shops, coffee bars and pubs. This bright and airy second floor apartment comprises two bedrooms (a double and a kingsize / twin), bathroom and a large kitchen/dining/living room. The well equipped kitchen has a full oven and microwave, and there is a separate utility room with laundry facilities. There is TV, a DVD and Wifi if you are staying in. If you are going out, within five minutes walk there are a least five pubs, five coffee shops and a range of restaurants. In the main bedroom there is window seating with a view to the sea, which is a five minute walk away. Parking is in Brighton Zone H. We have limited visitor parking permits at £3 per day, payable on arrival, but please confirm when booking. Alternatively, non restricted parking is a 10 minute walk. We stayed here for 3 nights and could not have felt more at home. Ken and Mike the owners were prompt and welcoming. This place is walking distance to great restaurants as well as a 10 minute walk to the pier. We were in for St. Pattys day from the states and were so happy to have experienced a Brighton ST. Pattys celebration. Thank you again Ken and Mike for all of your help and hospitality. 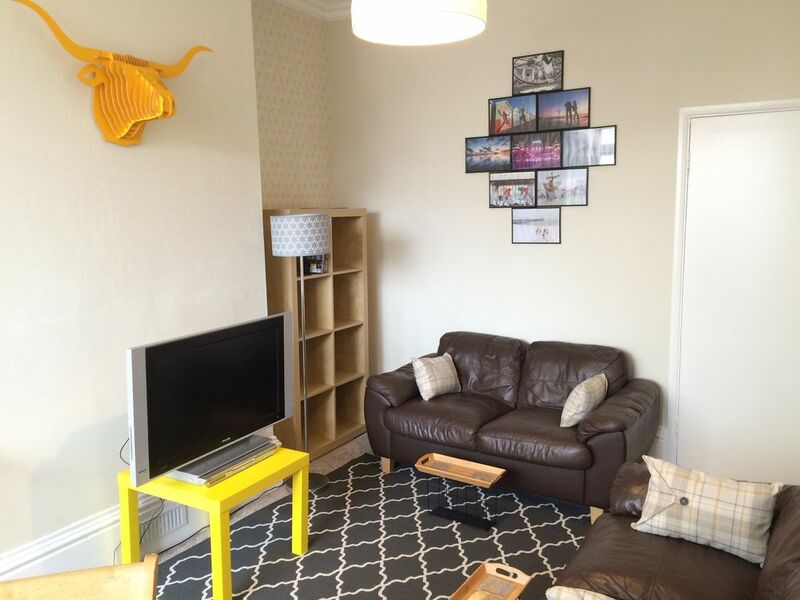 A lovely flat,a great location with friendly and attentive hosts. 4 of us came to stay, one to run the Brighton Marathon, and 3 to support her! The flat had already been recommended by a runner last year and we weren’t disappointed! Clean and comfy, with everything we needed for our weekend. Mike & Ken kept in touch and we’re quick to respond to any queries. They left us parking permits (£3 a day) for the nearby roads, and although we didn’t get a space outside we were able to park around the corner. Wouldn’t hesitate to recommend or return for another visit. P.S particularly recommend Cup of Joe, in St George’s Rd for a great coffee and breakfast! Great flat in a lovely location. Clean and well equipped - everything has been thought of. Walking distance to everything, along the seafront or through the interesting back streets. Great local shops, pubs and cafes on the doorstep. Very friendly welcome on arrival. Would recommend and come again. Thanks so much. The apartment is in a nice quiet part of Brighton, but only 10-15 minutes walk from the pier and just round the corner from a bus stop with regular service. There is also a good selection of shops and cafes round the corner from the flat if you need to pop out for supplies. The flat was well kitted out with lots of nice touches, including provision of essentials like toilet rolls, milk, tea bags etc. There was also loads of books, DVDs and games if you needed entertainment on a wet afternoon (which we were lucky to avoid during our stay!). The rooms are spacious and there was plenty of space for the four of us. The apartment owners were also really helpful - they were happy to recommend eating places and things to do before we arrived, and were easy to deal with while we were staying in the apartment. Highly recommended. A lovely apartment in an excellent location. We had a very enjoyable stay in this very well appointed apartment in an excellent location, very conveniently near the sea and with very good facilities in the area, where we had a great choice of places to eat out, but also good shops where we could buy groceries etc for self catering. The flat is very comfortable and well equipped, very clean, and the hosts really welcoming. We stayed here while house hunting with our son, and will certainly stay again when we visit him after he moves to live in Brighton. Thank you so much for making our stay so relaxing and enjoyable. Kemptown Village is a vibrant centre with a wide range of independent shops, restaurants, bars and pubs. There are some quirky vintage and antique shops as well as more practical ones such as a local co-op for groceries, a greengrocer, butcher, chemist and post office. St James' Street is a 10 minute walk away, and the Lanes and North Laine a 20 minute walk away or a short bus ride - the 1, 1A and 7 from the top of the road will take you into town or to the railway station. Going down to the beach, the Yellow Wave Beach Volleyball centre, the Peter Pan Playground and Adventure Golf are directly in front. Off to the left, the Marina is a 30 minute walk or short bus ride on the 7. To the right, the Pier is 10 minutes away. Our favourite coffee shops include Spinelli (which is just next door), the Egg and Spoon, Compass Point, Artisan Deli, Ground, and Delicia, which does excellent Portuguese tarts as well as lovely sandwiches and baguettes. All are within 5 minutes walk. Pubs nearby are the Thomas Kemp, The Ginger Dog, the Golden Cannon, the Barley Mow, the Bristol Bar and the Hand in Hand. Something for everyone - from a traditional boozer through craft beer specialists to gastropubs. Restaurants include the Old Bank, which does excellent steak and ribs, 24 St George's and Kemp Town Spice. Takeaway includes Pizzaface, the Kemp Tandoori and a local kebab shop, Friars. You won't be short of somewhere to eat and St James' has more restaurants. If you are veggie, we recommend Planet India, which is very Brighton. We take a £100 security deposit to cover any damage or breakages which will be refunded back to you (on the card that you paid with) at the end of your stay. It may take up to a week to arrive. There is a £50 cleaning charge. Check in is between 3pm and 6pm on the Friday of arrival, or later by negotiation. Check out is by midday on day of departure.